NEWS: A Spokane County Sheriff's Office detective has been sharing memes, videos and articles on Facebook that trash the Black Lives Matter movement. 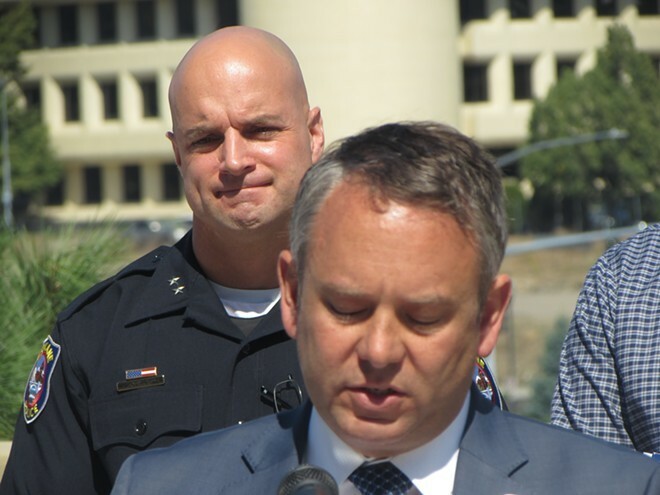 NEWS: We thought Spokane City Council would vote last night on Mayor David Condon's pick for police chief, but then we found out Meidl's fate would not be decided until later. He will now go through the same interview process as the other candidates. ARTS & CULTURE: Spokane Arts director Laura Becker is leaving Spokane for Santa Monica, California. A federal judge has ordered that the State Department accelerate the release of nearly 15,000 Hillary Clinton emails, meaning they could be released weeks before the election. Meanwhile, Republicans allege that emails released Monday from Clinton's tenure as Secretary of State show that Clinton traded favors for donations to the Clinton Foundation. Clinton and the foundation deny the charge. Donald Trump says he has an immigration plan, and it apparently no longer involves deporting 11 million people using a "deportation force." Rather, it will be similar to what Obama is doing, but with "a lot more energy."